湖泊科学 2016, Vol. 28 Issue (1): 178-186. DOI: 10.18307/2016.0121. 万安, 张晓可, 谢枫, 韩旭, 邓洁, 钟明, 李宁, 安树青, 低头坝养鱼对上下游局域栖息地和鱼类群落时空格局的影响. 湖泊科学, 2016, 28(1): 178-186. DOI: 10.18307/2016.0121. WAN An, ZHANG Xiaoke, XIE Feng, HAN Xu, DENG Jie, ZHONG Ming, LI Ning, AN Shuqing. Low-head-dam fish culture effects on spatial-temporal patterns of local habitat and fish assemblages in the upstream and downstream of rivers. Journal of Lake Sciences, 2016, 28(1): 178-186. DOI: 10.18307/2016.0121. 作者简介：万安(1980~), 男, 博士研究生, 副教授; E-mail:wanan@aqtc.edu.cn. 摘要：河流鱼类的群落特征会随栖息地环境的变化而发生变化.为了解鱼类群落对低头坝养鱼的响应程度, 20132014年共6次调查了乌龙河(长江下游支流)两个可涉水河段样点(上游坝和下游坝)的环境因子、鱼类多样性及其群落结构.共采集到5目10科21属24种鱼类, 以鲤形目鲤科最多, 占总数的58.3%.通过解析时空动态变化与局域栖息地条件对鱼类群落的影响, 发现季节因素对鱼类群落结构无显著影响, 而鱼类群落所在空间位置(上游坝, 下游坝)对群落结构差异具有较显著影响, 其中上游中华鳑鲏(Rhodeus sinensis)、(Hemiculter leucisculus)、棒花鱼(Abbottina rivularis)、大鳍鱊(Acheilognathus macropterus), 下游食蚊鱼(Gambusia affinis)的多度决定了这种差异; 而3个栖息地变量(溶解氧浓度、电导率和流速)均对鱼类群落特征具有显著性影响.栖息地环境差异对河流上、下游鱼类群落的影响较大, 具体体现在下游样点鱼类的捕获重量、捕获数量、密度、多样性明显下降, 推测利用低头坝养鱼是造成这些现象的重要原因. Abstract: Fish assemblage will change along with the river habitat environment. 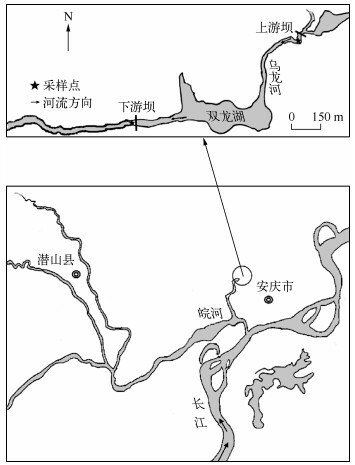 In order to find the response degree of fish assemblage to fish culture within low-head-dam water, two low-head dams (including the upstream and downstream dams) of the Wulong River (a tributary of the lower reach of the Yangtze River, China) were selected as sampling sites, where the habitat variables, the fish diversity and fish assemblage structure were surveyed for 6 times from 2013 to 2014 in these wadeable reaches of the sampling sites. A total of 24 fish species which belong to 5 orders, 21 genera and 24 species were caught, with dominant Cyprinidae accounting for 58.3% of the total. After an analysis on the influences of temporal changes and local habitat conditions upon the fish assemblage, seasonal factors were found to have no apparent effect on the fish assemblage structure. The spatial location (the upstream dam or the downstream dam) affected the assemblage's structural differences significantly, which were determined by the abundance of Hemiculter leucisculus, Abbottina rivularis, Rhodeus sinensis, Acheilognathus macropterus in the upstream site, and the abundance of Gambusia affinis in downstream site. Besides, all the three habitat variables including dissolved oxygen, conductivity and current velocity exerted a great impact on the fish assemblage. The differences in habitat environment bring about some great influences on the fish assemblage, showing in the dramatic decrease of capture weight, quantity, density and diversity of fish in the sampling sites of the downstream dam, which are probably caused by the fish culture within the low-head dam. 鱼类作为河流生态系统中的高等动物类群，它们的出生、生长、繁殖和死亡等生活史事件都是在河流中完成的，河流的生境特征对鱼类多样性及其群落结构有着重要影响.同时由于鱼类对河流生态系统的食物网动态、营养和物质循环、生态系统的恢复能力等具有重要的调节作用，因此鱼类多样性对于维持稳定的河流生态系统结构和功能有着十分重要的作用.自然河流的环境呈现的是一种连续的线性梯度变化过程，河流鱼类的物种分布、丰富度和群落结构会随环境梯度的变化而变化，但当这种环境梯度被中断(如水利工程)时，河流自然流态机制将随之而改变，使鱼类难以正常完成生活史循环；此外受农业灌溉、水体污染[3 — 4]、土地利用等的影响，河流鱼类多样性和物种丰富度也正在逐渐下降和减少，鱼类群落的空间格局也随之改变[6 — 8].通过观测鱼类群落空间格局的变化，可以了解河流生态系统的变化情况. 在诸多影响鱼类群落变化的因素中，水坝无疑是最普遍、最典型的一种人为干扰形式.水坝又可分为高头坝(high-headdam)和低头坝(low-headdam)，其本质区别在于前者坝头较高并能完全截流，后者坝头较低因而不能完全截流.目前，国内外对水坝生态学效应的研究大多数聚焦于大型水坝，仅有少量研究有关低头坝对河流鱼类群落结构及其多样性的影响，如在鱼类多样性上，Tiemann等发现紧邻水坝局部河段中的鱼类多度、密度和均匀度受到低头坝的显著影响，而鱼类物种丰富度无显著变化；Dodd等则发现，坝下冲刷区的物种丰富度显著高于其它河段.从鱼类群落结构水平看，虽然低头坝显著影响了少数物种的优势度，而鱼类群落结构却没有显著变化[13 — 14]；但Gillette等、Poulet和Yan等则观察到与远离水坝的河段相比，蓄水区的急流性鱼类显著减少且缓流性或静水性鱼类显著增多; 而Yan等更进一步发现低头坝减弱了鱼类群落在河流网络中的空间自相关性，并且与本地入侵种(nativeinvaders)鱼类的多样性增加有较大相关.上述有关低头坝对鱼类群落影响的研究结果之间尚存很大争议和分歧[15-17, 20-21]，推测低头坝产生的生态学效应很可能与水坝自身的属性、人为干扰程度以及数量累积效应密切相关[11, 18, 22]. 为提高数据的正态性和方差齐性，降低极端数值的负面影响，将相关鱼类数据和栖息地变量数据进行对数lg(x+1)转化，在PRIMER5.0软件中，运用单因素相似性分析(one-way crossed ANOSIM)，分别检验空间因素和时间因素对鱼类群落结构的影响；运用非参数多变量排序(nonmetric multidimensional scaling，NMS)方法，构建鱼类群落结构的二维双标图；最后，运用相似性百分比(SIMPER)分析，解析形成群落差异的关键贡献物种. 调查期间内，上游坝水色为澄清，无味，岸边有菰(Zizania latifolia)、菖蒲(Acorus calamus)、芦苇(Phragmites australis)，河岸及河中央有苦草(Vallisneria natans)、金鱼藻(Ceratophyllum demersum)、狐尾藻(Myriophyllum)等水下植物；下游坝水色为深绿色，有臭味，岸边有狗牙根(Cynodon dactylon)、水花生(Alternanthera philoxeroides)、水蓼(Polygonum hydropiper)，河岸水下有黑藻(Hydrilla)，河中央无沉水植物. 12样次共捕获标本626尾，隶属5目10科21属24种.以鲤形目最多(15种)，占总数的62.5 %，鲈形目有5种，占总数的20.8 %；全部10科中，鲤科鱼类最多(14种)，分布于6个亚科，占总数的58.3 %，其次是塘鳢科鱼类2种，占8.3 %，其他各科鱼类总计占33.4 %；所捕获的24种鱼类都属于定居型物种，无洄游性或半洄游性物种. 上游坝常见种为宽鳍鱲、马口鱼、、油、飘鱼、细鳞鲴、大鳍鱊、兴凯鱊、中华鳑鲏、棒花鱼、麦穗鱼、亮银鮈、银鮈、鲫、泥鳅、子陵吻鰕虎鱼、刺鳅、黄黝鱼、沙塘鳢等19种(F＞40 %)，鲇、圆尾拟鲿、乌鳢、黄鳝为偶见种(10 %＜F≤40 %)，未见稀有种(F≤10 %)；优势鱼类有14种：宽鳍鱲、马口鱼、、飘鱼、细鳞鲴、大鳍鱊、兴凯鱊、中华鳑鲏、棒花鱼、银鮈、鲫、泥鳅、子陵吻鰕虎鱼、沙塘鳢(IVI＞100)；其中宽鳍鱲、马口鱼、亮银鮈、银鮈、沙塘鳢5种均为喜流性鱼类，其余18种为静水性鱼类. 下游坝常见种为鲫、泥鳅、食蚊鱼3种(F＞40 %)，麦穗鱼为偶见种(10 %＜F≤40 %)，未见稀有种(F≤10 %)，优势鱼类有鲫、泥鳅、食蚊鱼3种(IVI＞100)(表 1)，均为静水性鱼类. 此外，上游坝的鱼类数量相对多度排列顺序为：中华鳑鲏(27.81 %)＞(10.71 %)＞鲫(9.67 %)＞棒花(9.5 %)，下游坝为鲫(57.14 %)＞食蚊鱼(23.81 %)＞泥鳅(16.67 %)＞麦穗鱼(2.38 %).与表 1中所示顺序不同，相似性百分比(SIMPER)显示上游坝的中华鰟鲏、、棒花鱼、大鳍鱊，下游坝的食蚊鱼对上、下游鱼类群落的空间变化贡献值较大. 同样, CCA分析结果表明，该河段中鱼类(除食蚊鱼和鲫外)基本集中在轴1和轴2交叉点的左部(图 4)，表明这些物种生境需求基本类似，种间竞争激烈，且生态幅较小，无论环境中流速、溶解氧浓度增加和减少，均不利于这些鱼类生存，说明该河段中的鱼类群落对外界环境的变化也应较为敏感，生境较脆弱；而鱼类分布差异主要受溶解氧浓度、电导率和流速3个环境因素影响，特别是食蚊鱼和鲫，这两种较耐受不良环境的鱼，远离其他鱼类聚集的区域，喜温度较高、电导率较高的环境(图 4)；在鱼类组成种类上，上游坝共有23种鱼，其中宽鳍鱲、马口鱼、亮银鮈、银鮈、沙塘鳢5种为喜流性鱼类，其余18种为静水性鱼类；而下游坝的鱼类群落仅有麦穗鱼、鲫、泥鳅和食蚊鱼，并且3种优势种均为耐污生命力强的静水性鱼类.这与Yan等发现的坝下冲刷区与参考区域的鱼类(喜静水、喜流水均有)群落组成相差不大的结论有明显的不同.以上结果表明上下坝冲刷区环境条件的改变造成了各样点间不同的鱼类群落组成特点[19, 35]. 同时发现在上游样点各月份的捕获重量、捕获数量、密度和多样性均高于下游样点，且上游样点自身秋季(10、11月)的捕获重量、捕获数量、密度和多样性高于4月(图 2).一般认为亚热带地区的平水期(4月)和枯水期(10、11月)恰为鱼类的繁殖前期和非繁殖期，而冬季普遍温度低且降雨量极小，非常不利于鱼类的生存，因此经过越冬后，4月份鱼类种群数量、生物量均出现下降，而秋季(10、11月)因为有当年生的幼体补充，鱼类种群数量和密度反而增加(图 2).这与在同一地区的青弋江、秋浦河观察到的结果相似[23, 36].同时与在秋浦河观察的结果一致，相对于4月，上游坝采样地7月份的渔获物数量和密度降低(图 2)，而多样性指数则有降(2013年)有升(2014年)(图 2)，这很可能与丰水期间雨量充沛，鱼类栖息地面积增加，电捕器的捕获效率下降，导致偶然误差较多有关.同时观察到在下游采样点7月份的捕获重量、捕获数量、密度和多样性指数均较其他月份出现增高的趋势(图 2)，这很可能与下游坝在夏季水量较大，水体环境得到改善，下游鱼类上溯有关. Allan JD. Landscapes and riverscapes:the influence of land use on stream ecosystems. Annual Review of Ecology, Evolution & Systematics, 2004, 35: 257-284. Galat DL, Berry CR, Garaner WM et al. Spatiotemporal patterns and changes in Missouri River fishes. American Fisheries Society Symposium, 2005, 45: 249-291. Karr JR, Fausch KD, Angermeier PL et al. Assessing biological integrity in running waters:A method and its rationale. Champaign:Illinois Natural History Survey(Special Publication), 1986, 1-31. Dodd HR, Hayes DB, Baylis JR et al. Low-head sea lamprey barrier effects on stream habitat and fish communities in Great Lakes basin. Journal of Great Lakes Research, 2003, 29(Suppl. 1): 386-402. Gillette DP, Tiemann JS, Edds DR et al. Spatiotemporal patterns of fish assemblage structure in a river impoundment by low-head dams. Copeia, 2005, 3: 539-549. Yan YZ. Influences of low-head dams on fish assemblages in the headwater streams of the Qingyi River, China. 144th Annual Meeting of the American Fisheries Society. Afs, 2014. Chu L, Wang W, Zhu R et al. 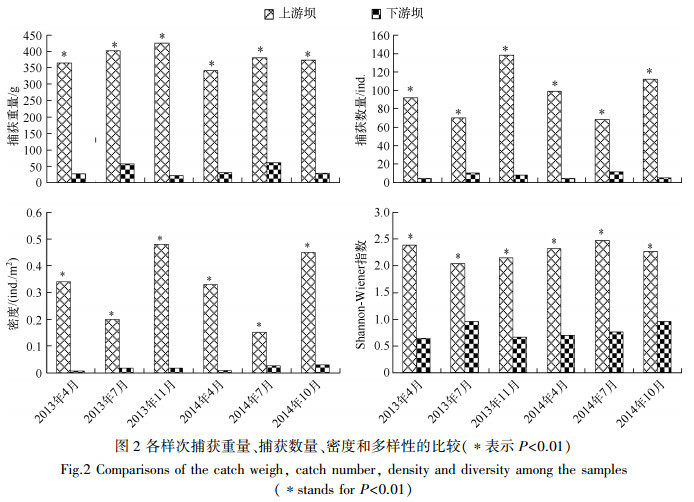 Variation in fish assemblages across impoundments of low-head dams in headwater streams of the Qingyi River, China:effects of abiotic factors and native invaders. Environmental Biology of Fishes, 2014, 98(1): 101-112. Ward JV, Stanford JA. The serial discontinuity concept of lotic ecosystems. In:Fontaine TD, Bartell SM eds. Dynamics of lotic ecosystems, Ann Arbor Science, Ann Arbor, MI, 1983:29-42. 王红. 低头坝对青弋江河源溪流局域栖息地, 鱼类多样性及其群落结构的影响[学位论文]. 合肥: 安徽师范大学, 2012. 祁继英, 阮晓红. 大坝对河流生态系统的环境影响分析. 河海大学学报: 自然科学版, 2005, 33(1): 37-40. 郑奕, 刘新春, 杨金龙等. 塔里木河上游地区阿拉尔段天然退化生态系统植物群落物种多样性特征分析. 水土保持研究, 2005, 12(2): 131-134. 周劲风, 温琰茂, 梁志谦. 珠江三角洲密养池塘的水质特点分析. 水产科学, 2005, 23(12): 13-17. 陈生熬, 童华文, 霍佳佳等. 塔里木河流域淡水养殖业可持续发展思考. 塔里木大学学报, 2008, 19(4): 103-106. 安树青, 李哈滨, 关保华等. 中国的天然湿地:过去的问题, 现状和未来的挑战. AMBIO-人类环境杂志, 2007, 36(4): 317-324. 邓朝阳, 朱仁, 严云志. 长江芜湖江段鱼类多样性及其群落结构的时空格局. 淡水渔业, 2013, 43(1): 28-36. Gauch HG. Multivariate analysis in community ecology. New York: Cambridge University Press, 1982, 23. Welcomme RL. The biology and ecology of the fishes of a small tropical stream. Journal of Zoology, 1969(4): 485-529. 王文剑, 储玲, 司春等. 秋浦河源国家湿地公园溪流鱼类群落的时空格局. 动物学研究, 2013, 34(4): 417-428.